Operation Walk was founded in 1995 with the mission of providing free surgical treatments for patients in developing countries. Ever since, the non-for-profit, volunteer organization has performed thousands of procedures to treat debilitating bone and joint conditions. 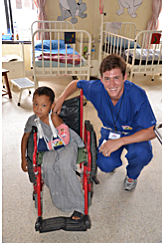 The surgeries are provided for patients who would otherwise have no access to the life-changing care. This past June, I was fortunate to be able to volunteer with an Operation Walk team from Northwestern Orthopaedic Institute travelling on a medical mission to Kathmandu. Our Operation Walk team consisted of four doctors—two surgeons, an internist, and an anesthesiologist—three nurses, three medical technicians, a physical therapist, and myself as a physical therapist’s assistant. The team performed fifteen hip and knee replacements to restore pain-free mobility to patients ranging in age from early-twenties to mid-eighties. The surgeries were performed at the Nepal Orthopaedic Hospital, where our Op Walk team was also working to train Nepali surgeons and staff with the goal of setting up the first joint replacement program in Nepal. Nepal is most famous for Mt. Everest and the Himalayas, the world’s tallest mountain range. The mountains, visible at above eye-level on the descent into and the ascent from Kathmandu, are spectacular. Kathmandu, situated in a Himalayan valley, is Nepal’s largest city and, according to the WHO, the most polluted city in Asia. Most citizens in Kathmandu live in poverty with an income of less than a few dollars per day and no access to clean water. Scheduled power outages are a result of government rationing, as the power grid in Kathmandu is insufficient for the city’s demands. The Nepal Orthopaedic Hospital has a backup generator, but it remains disconcerting when power momentarily cuts out during surgery. Still, the city is home to a rich religious and cultural history, with ancient palaces and Buddhist and Hindu temples dating back hundreds of years, including the most holy cremation site in Hindu, Pashupatinath Temple, which dates to 400 A.D. The streets of Kathmandu are a buzzing and chaotic scattering of vehicles from the last hundred years. Emaciated cows pick at trash heaps on the streets, while stray dogs duck into alleyways to avoid the oncoming rush of two, three, and four-wheeled vehicles. Monkeys prance along rooftops and religious men stroll along the streets in strong robes of orange and red. At the time of our arrival, police in riot garb prepared to constrain Maoist protests against the burgeoning democratic regime—formed in 2006 when King Gyanedra relinquished sovereign power after a decade of civil war and the murder-suicide of the Royal Family by his brother, the Crown Prince Dipendra, in 2001. The families that I met were strong and welcoming. They were sincerely grateful for our help, and, although communication was often limited to hand gestures, were incessant in expressing thanks. Here is a photo of me with my slightly camera shy, tree-climbing friend from the pediatric unit. Traveling to Kathmandu was a humbling and rewarding experience. The Operation Walk team restored mobility and daily functionality to fifteen individuals, and I appreciate the opportunity to be involved with such a valuable organization. Their next trip is to Vietnam in early January, where they will perform over seventy joint replacements.